Features overload and shorting protection. 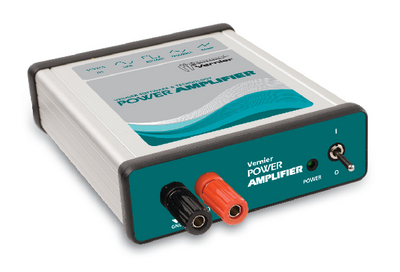 The Power Amplifier takes small input signal – from a LabQuest 2, original LabQuest, or computer – and amplifies it to produce voltages from -10 to 10 V and currents up to 1 A. Can provide a steady, linearly-controlled DC output for driving loads like DC motors or DC circuits, and precise AC waveforms for driving things like RLC circuits and speakers. Utilizes internal feedback for accurate AC waveforms (sine, square, triangle, and sawtooth) and DC levels. Current monitor function allows you to log real-time load current with any Vernier interface. Supports input signals from the LabQuest 2 or original LabQuest’s Power Amplifier app, our free PC software Power Amplifier Frequency Generator (Windows or Mac), or Logger Pro 3.8 or newer (LabPro only). Also supports an input signal from LabVIEW via the SensorDAQ interface.